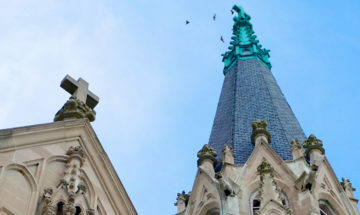 “The Joseph Cone house in North Vernon’s State Street Historic District is one of those ‘slam on the brakes’ landmarks,” says Greg Sekula, director of Indiana Landmarks’ Southern Regional Office. Located on a prominent corner on South Jennings Street, the confection of Queen Anne details — towering brick chimneys, decorative slate roof, patterned gable shingles, wraparound porch topped by a conical roof, and lots of gingerbread – demands your attention. 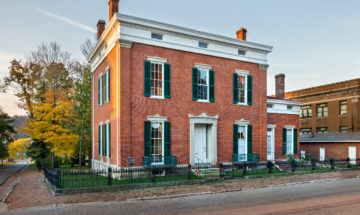 Banker and businessman Joseph Cone ordered plans for the large house from George F. Barber, a Knoxville, TN, architect know for the elaborate residential designs he marketed through mail-order catalogs. North Vernon boasts a number of houses attributed to Barber, but the Cone house stood out when it was completed in 1894. 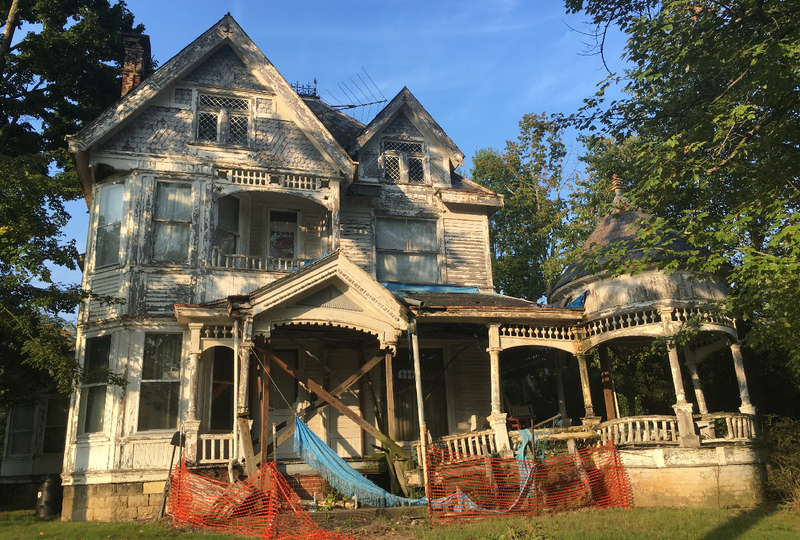 Attorneys Laura Harbison and Larry Gratehouse helped us navigate the path to save the house, including a commitment by the owner to donate the home to Indiana Landmarks and an agreement by mortgage giant Fannie Mae to forgive the remaining note. 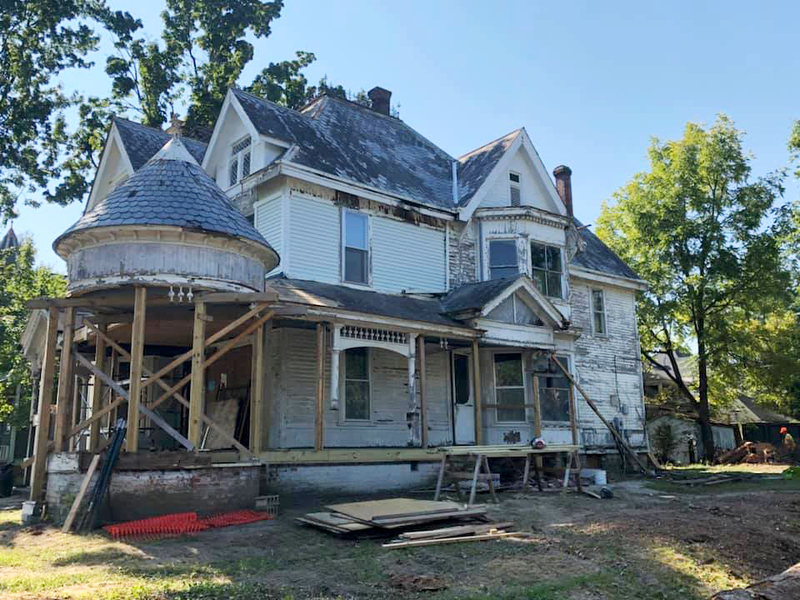 A temporary injunction granted by Jennings Circuit Court Judge Jon Webster stayed demolition on the condition that we complete substantial repairs by mid-December 2018. 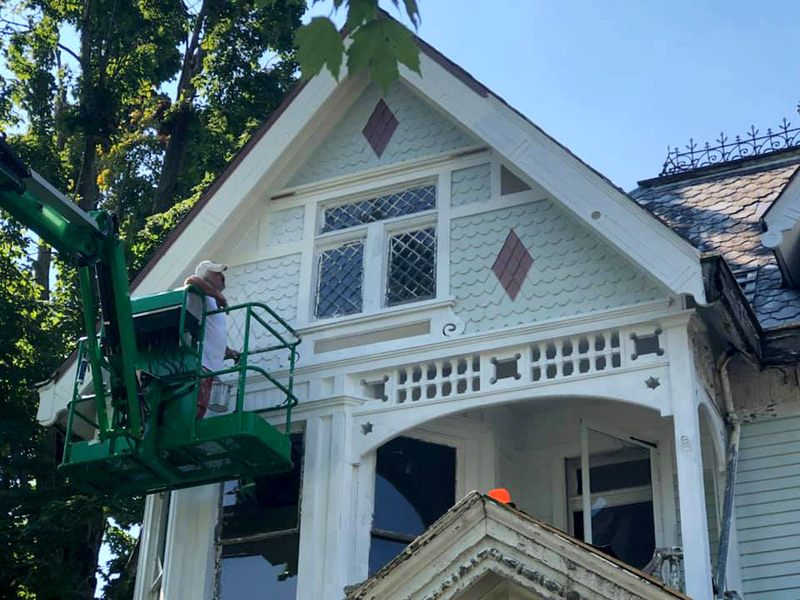 We’re using funds from our Efroymson Family Endangered Places Acquisition Fund to stabilize the building, and a local benefactor is providing funds for for exterior restoration — including rehab of the elaborate porch, structural repairs, work on the slate roof, interior clean-up, and exterior painting. Once improvements are complete, we’ll put the Cone House on the market, with preservation covenants to guide further restoration work. 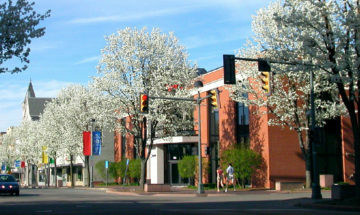 For more information, contact Indiana Landmarks’ Southern Regional Office, 812-284-4534, south@indianalandmarks.org.